The Victorious Roses Bronze Cremation Urn is made in an octagonal shape from finest bronze alloys. 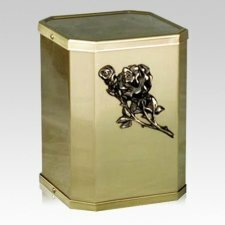 The Urn is accented with a beautiful rose appliqué and finished to the perfect shine. A true piece of art that can be displayed in any mausoleum or home to create the perfect resting place.